What Commandments Do Mormons Keep? The Book of Mormon teaches that men are that they might have joy. (See Jesus Christ, gave us commandments that, when practiced for the right reasons in the right spirit, would allow us to live a joyful life even in times of trials. Brigham Young was asked how he governed such a large group of people. He responded that he taught them correct principles and then let them govern themselves. 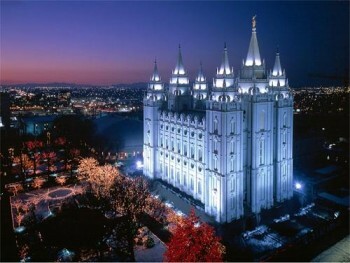 Mormons today are taught basic principles and are expected to apply them to the larger world. When faced with a situation not explicitly covered by a commandment, they study it in relationship to what they know overall of the gospel and then make a choice. Many commandments are designed to keep us morally and physically safe. For instance, Mormons are known for their health code, called the Word of Wisdom. This health code includes a prohibition against alcohol, tobacco, coffee, and tea. It encourages the use of whole grains, fruits, and vegetables, and suggests moderation in the use of meat. Although this was an odd way of living when the commandment was given by revelation from Joseph Smith in the 1800s, today science has caught up to revelation and agrees that this is indeed a healthy way to live. Following the statement of Brigham Young about governing ourselves, Mormons are also reminded to make other healthy choices, even if they aren’t specified in the commandment. Mormons have a strict code of morality. Both men and women are counseled to practice the law of chastity. Intimate relationships are not permitted outside of marriage, even if the person never marries. Teenagers are taught to avoid dating until they are sixteen and then only in groups until they are adults. This helps to protect their morality and also helps them to finish high school. Service to others is a critical part of the commandments. Jesus Christ taught us to give of both our time and resources to others. Mormons do this through church programs, but also give in their personal lives as well. An example of a church program designed to help Mormons give is the fast offerings program. The first Sunday of each month is designated as Fast Sunday. The previous afternoon, Mormons who can safely do so begin a twenty-four hour complete fast-no food or drink of any kind-and donate the money saved by missing those two meals and snacks to a special fund that is separate from other church funds. It goes to help those in their congregation who are in need of food or other charitable help. While many can afford to give the money without experiencing any real sacrifice, the requirement to come up with the money by being hungry for a day causes them to think more carefully about what it would mean to be hungry all the time, and increases their ability to be compassionate. Mormons are taught to be as self-reliant as possible, even while knowing the church can help when they’ve done all they can do for themselves and their families. To this end, they work to store at least a year’s supply of everything they would need should they experience unemployment, death of the wage-earner, or other challenges to their budget. This might not let them maintain their previous lifestyle, but it will allow them to feed their family and pay their bills during the crisis. When times are tight, they have the security of knowing they will be okay. Mormons are commanded to get education, both formal and informal. This is part of their self-sufficiency plan, as a formal education can make it easier to have a career. Women, who are encouraged to remain in the home to raise their children, are also commanded to get an education and to be prepared to care for their families should the need arise, such as in the death or disability of the wage earner. In addition to the formal education, Mormons are encouraged to continue a life-long process of learning in both secular and spiritual realms. They’re taught that whatever they learn in this life will carry on into the next. Family is central to Mormon teachings. Husbands and wives are commanded to love and care for each other, and together they are commanded to love and care for their children. No matter how busy their lives might be, families are taught to make their family life a priority, and to spend time together. Each Monday night, Mormon families stay home, without friends, and hold Family Home Evening. During this time, they teach the gospel of Jesus Christ, resolve family concerns, and have fun together. It ensures some meaningful family time each week and also allows parents a setting in which to share their testimonies and values. Mormon families believe it is the responsibility of the parents to teach their children their religion and their values. Although the Church has programs to assist the parents, they are only assisting, not taking over. For this reason, Mormon families have daily family, couple, and personal prayers, as well as daily scripture study as a family and as an individual. During this time, parents show their children what they believe and demonstrate, through both words and action, how to live what they believe. Prayer and scripture study are critical aspects of Mormon commandments. Prayer allows each person to communicate with God and to build a personal and loving relationship with Him. It’s a way to seek answers for the help we need and also to thank God for the blessings we’ve received. Scripture study helps us to learn the commandments. Mormons are taught to read the Bible, as well as the restoration scriptures, and to apply the teachings to their everyday lives. There are more commandments than can be listed here, but these are a sampling of the commandments Mormons follow in order to live a Christ-like and meaningful life. These commandments safeguard morality and health, promote a loving family, and prepare us to live again in the presence of God.